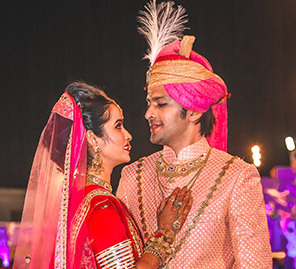 Bangkok-based Suveera and Radhika hosted their wedding in Thailand which was planned and executed by S&R Productions and WeddingSutra Favorite - Shanaya Celebrations. Their fun celebrations such as the welcome dinner, pool party and reception were held at the stunning Sheraton Hua Hin Resort & Spa. 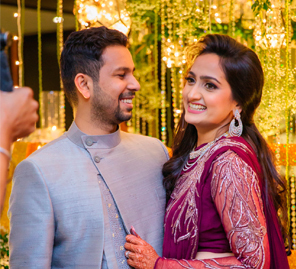 Take a peek at some of the fun highlights and memories captured by WeddingSutra Favourite - Koro Films. “We contacted the vendors ourselves and to be honest it was fun. We learned a lot about planning a wedding, and how detailed it can be. To be honest, at times it was also stressful as Suveera and I had different tastes and opinions on a lot of things. We decided on creating mood boards on Powerpoint for each function. Whatever we liked on Pinterest such as themes, color schemes, and floral arrangements, we added to our mood boards and finalized our choices over time. Shanaya Celebrations coordinated our events on each day and they were a huge help. I can't thank their incredible team enough for all that they did for us!" “The Sheraton Hua Hin Resort & Spa in Thailand is such a beautiful property. We had attended a few weddings there in the past and always loved the place. 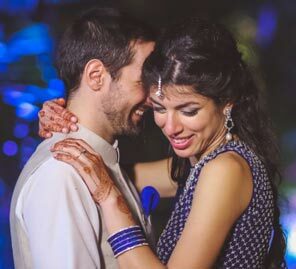 We wanted a tried and tested venue with experienced staff that offered a maximum level of fun and a minimum level of headache, so we decided to host some of our wedding celebrations at this resort." 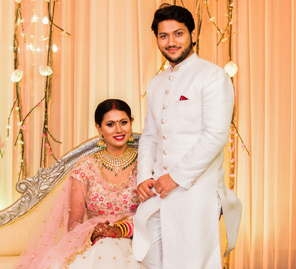 “We wanted the mehndi function to be very simple and elegant, so the decor had a very subtle color palette. We hosted this function at the Radisson Blu Hotel and had lots of fun. The venue was decorated with pastel pink and peach drapes, flowers and tassels. This was the first function where both the families came together, and we started the ceremonies with 'sagan' (traditional engagement ceremony) led by Lalit Pandit which was followed by the ring ceremony. At this event, Suveera and I decided to coordinate the color of our outfits and we chose to wear yellow. I got my sharara made from Anamika, whereas Suveera got his from a Bangkok-based designer called Pavni." “We hosted our welcome dinner on the lawn by the beach. We wanted this party to be more of a sit-down event as our friends would be giving speeches. I wore a pink floral gown by Dolly J which paired well with the enchanted and romantic ambiance we had going on. The decor had a charming rustic vibe with the wooden bar, welcome signs and entrance doors. We also had fairy lights wrapped around and strung between the coconut trees. We lit lanterns on the walkway which gave the environs a very magical and warm feel. DJ Sparsh played rocking Bollywood and pop music from the 70s and 80s. After the welcome dinner, we had a neon party at the resort's Black Nightclub where guests got glow sticks and drinks in LED glasses. Everyone danced and partied till the wee hours of the morning." “The decor for the pool party included a color palette of hot pink and turquoise. We had a huge round bar in the center of the lawn, above which we fixed pretty white drapes. I was wearing a beautiful yellow and green Indian outfit that had a bohemian vibe. DJ Sparsh and Antonio on the saxophone played great music which set the mood for the party. It was a beautiful, sunny day, our guests relished the cocktails and after a while, people jumped into the pool for a splashing good time."